Remember last week, when I wrote about my crazy issues with expectations? Well, after attending the amazing dinner produced by Outstanding in the Field at East Fork Farm, I assumed that no local farm-to-table event could possibly compare to Chef Dissen's delicious meal. Take one noble organization: Hub City Farmers' Market. Add 14 local producers, seven prestigious chefs, a wine expert, a dozen volunteers, a lovely location with delightful hosts, and you have the recipe for a fabulous evening. The first annual Farm Dinner organized by Hub City Farmers' Market is proof that commitment to a cause inspires excellence. Hub City Farmers' Market is a not-for-profit organization, unlike Outstanding in the Field. The proceeds from the dinner benefit the organization's community gardens and farmers' markets, as well as the Mobile Market, which takes local, healthy food to several locations in Spartanburg County. The mission of the Hub City Farmers' Market is to increase the demand and availability of healthy food in Spartanburg County. The Market staff are terrific people. Dedicated. Creative. Eager to introduce local producers to the community and, in the case of the Farm Dinner, the community to the producers. Foodies unite with farmers, bakers with buyers. Executive Director Ana Parra leads the organization, and her talents are instrumental in the growth of the market and its programs. The amount of preparation and attention to detail required for the inaugural farm dinner is a full-time job. 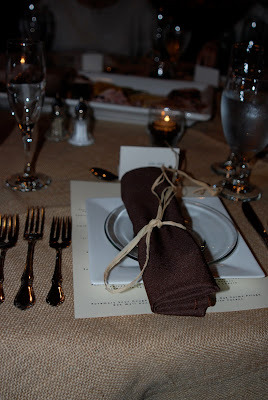 Live Oak Farms in Woodruff, SC, provided the perfect venue for a farm-to-table dinner. The hosts, Allison and Chuck Shaum, are committed to sustainability. Not only do they specialize in pasture raised, heritage breed animals, but their farm is a prototype for solar generated energy. The farm store, which stocks organic products, locally produced meats, certified naturally grown produce, and South Carolina seafood, is powered entirely by solar energy. Solar panels charge the electric fences surrounding the fields. The Schaums don't just talk about the environment—they protect the resources that provide their livelihood. Did I mention that they are genuinely nice people? Allison is the kind of person who remembers everyone's name, who takes the time to listen to the crazy ravings of a customer who fears preparing her first organic, free-range turkey for Thanksgiving. She's also the mother of four children, so she's good at managing her high-maintenance customers like me. I wish she lived next door. But we weren't alone. 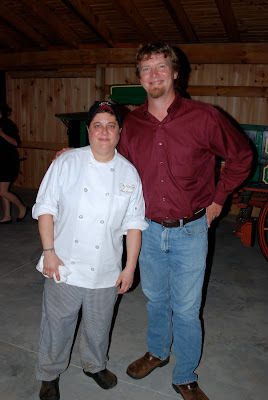 The Schaum's barn was crowded with locavores, eager to support the cause. Or, perhaps the attendees weren't as altruistic as I imagine. Maybe they just wanted to feast. And drink. No matter what the diners' motivations, they wouldn't be disappointed. The setting was actually more formal than the Outstanding in the Field dinner. I know you're thinking: barn = formal? Really? OK, skeptics, take a look at the lovely tables...with assigned seating. and the new business manager of Converse Deli. I've known Daniel through Hub City Farmer's Market, and he's an incredible source of information about organic practices. Plus, he's just a really good guy who beams when he talks about his baby. I hope he snuck some dessert home for his wife, who stayed home with baby Ben.
. If you haven't seen the magazine yet, you can find copies of the premier issue at many local retail sources, including Live Oak Farms. The Upstate needed this publication—a source that brings providers and customers together, much like farm dinners. Through the publication, though, you can find more detailed, personal information about the growers, producers, and people behind local foods. It's a terrific resource, and I'm not just saying it because of the article about my seed saving venture. While the food is, of course, the enticement for the farm dinner, the best entertainment is to watch people coming together in an effort to support one another. For instance, Daniel and Samantha had not previously met. I'm not sure how that's possible, but the dinner provided an opportunity for them to meet and talk a bit of shop. The manager of Converse Deli was equally happy to meet Daniel. Converse Deli supports local food, to the extent that they recently invested in a 10-acre farm. Until the farm produces the amount of food they require for the restaurant, Daniel might be a source. All of this synergy occurred just at our table. Who knows what relationships formed among the other guests? Is it possible to have too much food? I tried to pace myself, really, I did. But with five courses paired with delicious wines, plus amazing breads (my downfall), plus dessert...I think I'm still in a food coma three days later. We began with the Charcuterie tray. Taken from the term cuiseur de chair, meaning "cooker of meat," charcuterie is a French culinary art dating to the 15th century. Originally a method to preserve food prior to the advent of refrigeration, it typically refers to pork specialties such as pâtés, rillettes, galantines, and crépinettes, which are made and sold in a delicatessen-style shop. Boiled Peanut Relish, Garlic Pickled Okra, Bread and Butter Saffron Turnips. Boiled peanut relish? Oh. My. Who would have thought? OK. Honestly, I could have stopped here. Between the meat and the bread, I was in heaven. Smoked Carolina Sunburst Trout with a Crayfish Butter on Toasted Brioche served with a Matignon of Brunoise Garden Vegetables and a Lime Coriander Vinaigrette. How does one make Crayfish Butter? You know, I don't really care. The trout and butter were scrumptious. Ravioli with Rabbit Confit and Sliced Butternut and Wilted Mustard Greens. 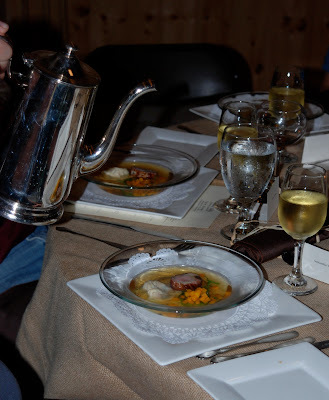 This course won the showmanship award, with the broth poured at the table. The scent alone added about two inches to each of my thighs. Crispy Okra Salad ~ Crispy Okra, Mizuna Greens, Turnips, Hericoverts, Cilantro, Carrots, Red Onion, Tossed with Honey Cumin Vinaigrette. Delicious greens, courtesy our tablemate, Daniel, expertly prepared by Chef Stephanie Tornatore from City Range. Crispy fried okra is my new favorite food. Or maybe my new favorite food is corn and bacon succotash. Bacon added to anything is good, but the corn was amazingly fresh on its own. My dad, a former farm boy, was a corn connoisseur. I know good corn. At this point, I had a hard time sitting upright in my chair—and it wasn't due to too much wine. I needed a walk. Or a nap. Apple Franzipan Crumb Cake with Wine Poached Apples, Cinnamon Calvados Crème Anglaise and Toasted Candy Pecans. Anyone who knows me also knows that I never leave dessert. Dessert is my favorite course. I couldn't conquer it. I ate half, wanting to lick the plate clean of the crème...and tried to figure out how I could sneak the rest of the cake home. I apologize to the goats and the artisans who produced the cheese plate. It was lovely, but I already looked and felt about eight months pregnant by this point in the meal. Besides trying to figure out how I could discreetly take my dessert home, I was also trying to determine how I could get Peter to carry me to the car. Unfortunately, Peter made me waddle to car on my own. More food? Who could possibly shop for food after eating five courses??? Note to self: never wear control-top tights to a multi-course farm dinner.